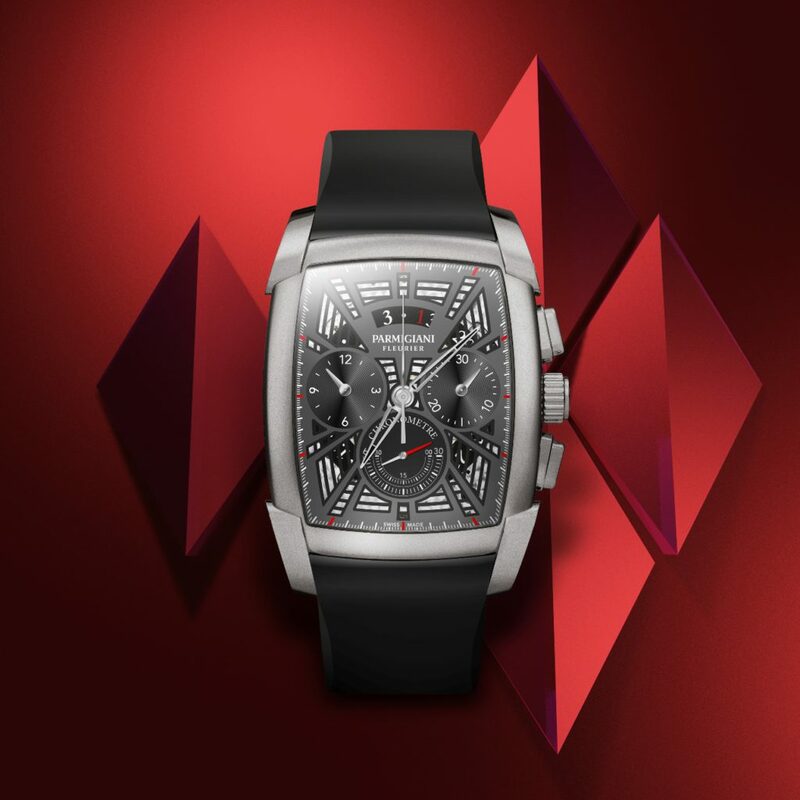 One of the novelties of this year’s salon of high watchmaking in Geneva was a luxury watch created based on last year’s model Kalpagraphe Chronomètre, which represents a new generation of the Kalpa collection from Parmigiani brand. 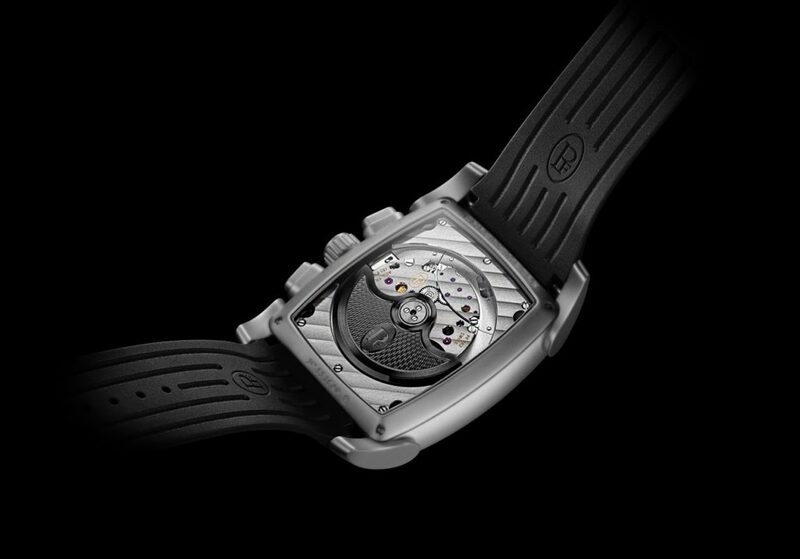 The barrel-shaped case is constructed out of titanium, the surface of which has been shot ­– blasted, and retains the parameters of the original model – with a thickness of 14 millimeters, the ratio of its sides is 48.2 x 40.4 millimeters (WR 30 m). Certain changes have also affected the dial: now it is a skeletonized plate with a pattern in the form of the sun’s rays diverging from the center, combining gray and dark gray color. The chronograph counters are highlighted by a thin circular groove, and the small second dial retains a smooth surface decorated with “CHRONOMETRE” inscription. This characteristic refers to the automatic caliber PF362 located inside the case, which was introduced in 2018. It is an integral chronograph with a 5-Hz balance, a power reserve of 65 hours, a column wheel and a vertical clutch, the development of which took 6 years. The automatic rotor of the new luxury watch featuring traditional guilloché motif “barley grain” is notable for the fact that it is made of platinum and has a dark color. The sporty nature of the new Parmigiani time device is further emphasized by a black colored rubber strap, which goes in combination with a folding titanium clasp. The next news concerns more sophisticated models. 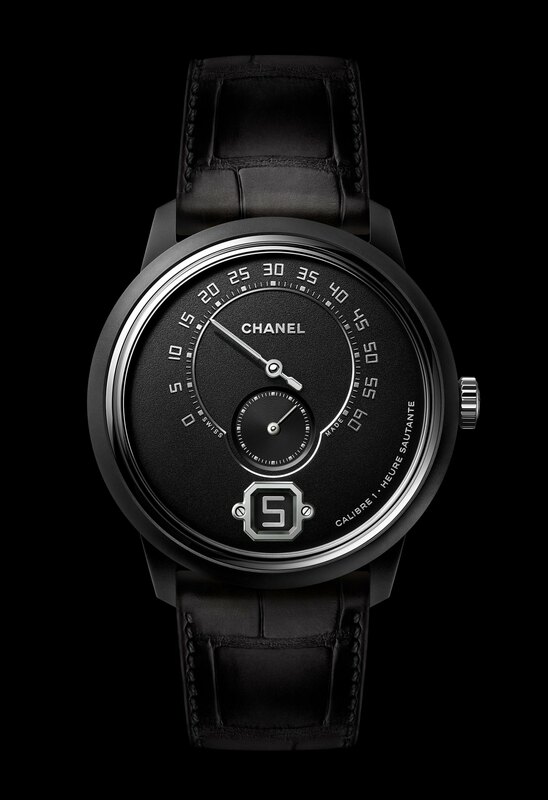 The firstborn of the Monsieur male collection of the watchmaking division of Chanel every year gets a new version of the performance – this time in the design of this luxury watch the combination of a black dial with “frosty” textured grinding and the case fabricated of matte black ceramic were used. In comparison with the earlier versions in gold and platinum, the case diameter increased from 40 to 42 millimeters, while the back cover and screw-down crown are made of stainless steel in contrast. The original indication in the form of a stylish window with a jumping hour, a retrograde minute indicator with a 240-degree scale and a second subdial is based on the operation of the Calibre 1 mechanism with manual winding. It represents a joint development of Chanel and Romain Gauthier, which is based on the layout scheme with two winding drums, providing an amazing power reserve of 72 hours. A black alligator leather strap accompanies new luxury watch, which is claimed as a limited series of 55 numbered copies. Do not forget to take a look at our collection of pre-owned luxury watches. There is a realm of eminent watch-producing brands offering exquisite time devices. Have a great shopping!